First Law of Thermodynamics – so easy to understand? When an elevator is moving with an acceleration, it becomes a non-nertial frame of reference. We find it difficult to apply Newton’s laws of motion for a non-nertial frame of reference, when the observer is a part of that reference. Here we will discuss the contribution of the concepts of pseudo force and discuss elevator physics with pseudo force. Once we start applying this concept, we can solve elevator physics problems with ease! Now you may read it with a cup of tea! Observer B is in an elevator. The elevator is moving upwards with an acceleration a. A box of mass M is resting on the elevator floor. Both observer B and the box are moving upwards with an acceleration a. 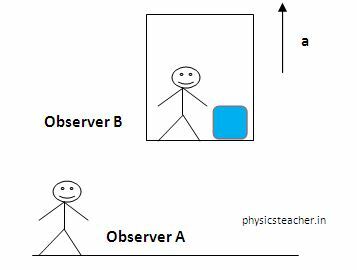 Observer A will observe the box in the elevator to move upwards with an acceleration a. Now we take observer B, who is travelling with the box in the same elevator. As both observer B and the box are within the same elevator frame of reference, observer B will find the box to be static. So for observer B, acceleration of the box equals zero. Observer B also will write motion equations following Newton’s 2nd law. 2 observers are giving different observations and interpretations of Newton’s law. We know why. Observer A watches the motion of the box from an inertial frame of reference. And we have read in one of our earlier posts that Newton’s laws are well applicable in inertial frame of reference. On the contrary observer B watches the box being a part of an accelerating or non-inertial frame of reference. And we know this type of frame of reference doesn’t directly support the Newton’s laws of motion, when the observer is also a part of the system. Then what to do for non-inertial frame of reference while solving numerical? Yes, you are right. We have to incorporate the concept of Pseudo force. Let’s see how we can do the same here in this case. Now with the inclusion of pseudo force if we draw the FBD of the box for observer B then see what we find. So we have just seen how just by including the concept of pseudo force we can successfully apply Newton’s 2nd law of motion even in an accelerating non-inertial frame of reference.